A trio of rainbows, a photo by The Bacher Family on Flickr. 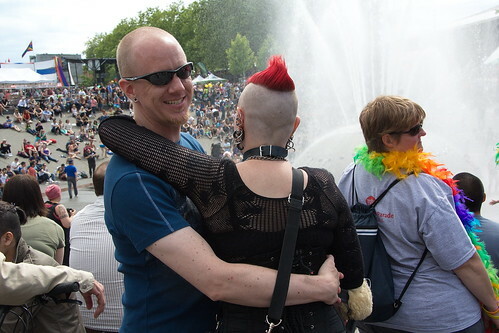 Without a doubt, the most interesting element of PrideFest, for a photographer, is the chance to photograph interesting people. For one day a year, some of the most colorful and unique and photogenic people in the city come out of their shells. I could literally wander among the crowd taking candid portraits all day, until I ran out of light or (in this case) memory card. Here is a trio of good examples. This might also be a good point to mention that, as a photographer, I try not to insert any of my own biases or prejudices into my pictures. I'm personally more interested in capturing the emotion that exists among the subjects of my photography than interjecting my own. And if the people whose images I'm capturing are aware of my presence, I want them to accept me as a sympathetic observer, not an antagonistic one. These young men are celebrating life, and that's enough for me.